Have you seen the marvelous Kevin B. Lee visual essay surrounding the trademark Steven Spielberg face? It’s engrossing and only nine minutes. Watch it, it’s fascinating. The Kubrick Stare. The person lowers the head and stares away signifying madness. Their signature stares have become a cliché. Whose are better? Kubrick or Spielberg? Thanks, Alex. I’d love to know your preferences…what’s your favorite Kubrick/Spielberg film? That is a very good question. My favourite Kubrick one is Paths of Glory. It’s astonishing. Such a powerful story and though most of it takes places indoors is so beautifully shot. I love Jaws. I read the book and it really brought it to the screen in the best way possible. Trying to arrange the order of the top 5 would be tricky. I confess I’ve not seen Paths of Glory. Must. Thanks for reminding me. Oh, the Kubrick stare just sends shivers down your spine. It’s so effective and chilling. I’m thinking I may have to spend a few hours in the bathroom in front of the mirror to extract some benefit from this one. One never knows just how powerfully influential a director can be on the rest of humanity–cast in their film or not! Muwha-ha-ha! Gotta go with the Kubrick stare. I think the effectiveness of Spielberg’s “face” has been blunted by over-use, to be honest, though when it works it works. Yeah, I’m pretty rough when it comes to coverage of post-9/11 Spielberg… I’ve seen MUNICH but I think that’s maybe it? War of the Worlds, Dakota Fanning, no wild-eyed wonderment there. Also with A.I. our robot Pinocchio has that stare…. Love this, thanks for sharing Cindy. Great find! Hi Adam. But wait! Which one gets you more? Hmm, I guess the Kubrick Stare because it’s tinged with misdemeanour. But I like them both! I really enjoyed the visual essay. 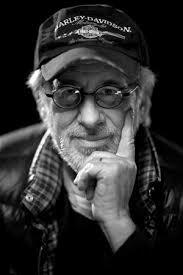 I am a fan of both Kubrick & Spielberg, both terrific filmmakers. 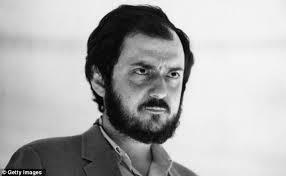 But I love Kubrick a load more than Spielberg, thus Kubrick for me is the better director. P.S. Also think the Kubrick FACE is way better, especially from ‘A Clockwork Orange’, my favourite film of his. The face, the message, the music in that is so powerful, yes? I only wish Kubrick had made more films before he passed. But, he was a true artist. The only film of his I have to watch is Paths of Glory. I don’t know what I’m waiting for…. I liked the visual essay, too. It made me think about Spielberg in a different way. IMO – Nicholson and Depp have the most expressive eyes. It’s all downward lighting. And dropping the head a fraction of an inch. Yes. Vincent D’Onfrio is scary, Frankenstein kind of way. Jack Nicholson does crazy and chews scenery better than most. As noted in ‘The Shining’. I’ll take it a few steps further with Nicholson’s “I am the Shore Patrol!! !” scene from ‘The Last Detail’. Still like Sterling Hayden’s rarely blinking visage ‘The Killing’ from Kubrick. Opposite George C. Scott’s manic Gen. “Buck” Turgidson trying to sell Mutual Assured Destruction” in ‘Dr. Strangelove’. Surprised you missed HAL’s red eye and monotone in ‘2001: A Space Odyssey’. Logically scary! What a fascinating topic here Cindy! Hmmm, I haven’t seen enough of Kubrick’s stuff but I have seen so many stills from his films. I don’t know about ‘better’ but Kubrick’s stares are definitely more ominous and unsettling, whilst a lot of Spielberg’s convey a sense of wonderment. Yes–I hope if you have nine minutes you get a chance to listen to the video about Spielberg. I thought it was fascinating. Kubrick stare is ominous, yes, but I’m going with Spielberg simply because he’s made three times as many films as Kubrick and therefore more influential. Oh I definitely like Spielberg in general. I’ve only seen a couple of Kubrick’s films, not really my cup of tea. This post is a hoot. Great stuff Cindy. You exactly right. That Kubrick stare that we see from Jack and Pyle are eerily similar.